Panama jubilados (retirees) brought traffic across Panama City to a virtual halt for over three hours on Monday, January 21, as they fulfilled their promise to continue their protests over lack of government action in adjusting pensions. A group kept Via Espana closed for almost two hours, which caused a huge traffic jam which quickly spread across the city. It was compounded by the closure of the Cinta Costera and Avenida Balboa at 6 a.m. for World Youth Day (WYD) activities. 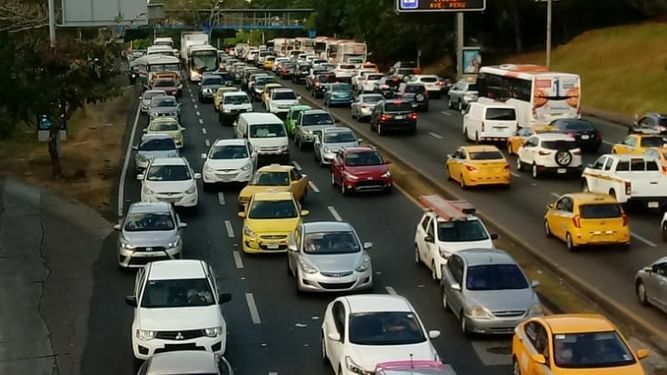 which had already led to a stop and go crawl on roads like Justo Arosemena, and the Northern corridor as buses and delivery trucks were diverted to new routes. The retirees, who are calling for an adjustment to their pensions, blocked Via Espana from 3:30 to 5.30 p.m.
With President Varela's attention focused on receiving Pope Francis on Thursday, the pensioners have so far got little response to their demands, but critics of the government expenditure of over $61 million on WYD, are raising their voices. Many workers planning to head home remained in their offices hoping for later relief but at 6.30 p.m. there was little relief on many roads. Later in the week, there will be fewer vehicles on the road as public service offices close for WYD. What really bothers me Hogan is that the Pope, who is said to be a crusader for the poor and helpless would allow all this money to be spent for his glorification. This to me is the height of hypocrisy. This is nothing but a huge party for a bunch of kids who probably could care less for anything the Pope is selling. They get to check Panama off their bucket list of places to travel. Much like the Super Bowl, the mess left behind, in addition to the administration and cost of security usually far outweigh whatever benefit the city derives. Maybe the $61 billion for the WYD party would have gone a long way to help pensioners. But I suspect old folks are several rungs down from "youth" appreciation, Pope coddling or even the $40 billion allocated for global warming initiatives/human trafficking. Few seem to stand and speak up for our senior citizens. Glad to see the pensioners are protesting for their fair share.